Get a couple breweries together lately, and they’ll go wild. A couple weeks ago, we reviewed Brett, a collaboration from The Lost Abbey and New Belgium that used Brettanomyces, a wild strain of yeast. 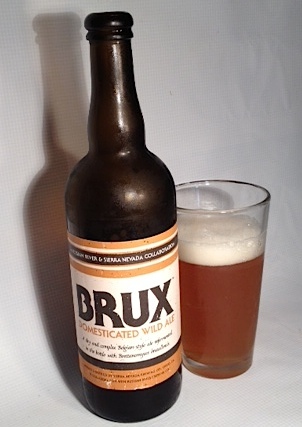 Today’s beer comes from two more premiere American breweries—Russian River and Sierra Nevada—and once again uses the wild yeasts prominent in Belgium farmhouse ales and sours. I have to say, though, Brux does it better. The citrus hop profile stands out with a bready richness underneath, meaning you don’t have to appreciate Belgian sours to enjoy this beer. The flipside is that this isn’t a beer to quench your thirst for that funky tartness of a sour. Instead this “Domesticated Wild Ale” is a more subtle, well-balanced Belgian-style golden that goes down easy with plenty of flavor and 8.3% ABV. And since it’s refermented in the bottle with the Brettanomyces, the flavor will only get more complex over time. It’s a distinctly American take on a European tradition, something both breweries have made into an art form.